I was recently invited to review two Amazingly Beautiful products - and give some away as well, so I thought it sounded interesting and agreed to review the product. Today I'm going to let you know both what Amazingly Beautiful moisturizer is and what I think about it . . . and announce a give-away! In addition, I'm happy to say, everyone will have an opportunity to receive one free bottle of moisturizer, if they are willing to pay the shipping. First, my review . . . While they are oils, they are quickly absorbed into the skin and do not feel "oily"
Trusted Health Products says; "Trying to keep your skin's chemistry in harmony on your own is an almost-impossible balancing act. But, when you use nature's pure live botanical oils, they help your facial oils to balance on their own, no matter what type of skin you have - dry or oily. Because your skin's inner layer is made up of fat and collagen, Amazingly Beautiful's pure botanical oils are naturally absorbed after being applied to your skin. No rubbing in is required. Amazingly Beautiful's proprietary A.M. Moisturizer and P.M. Revitalizer work together to help keep your face protected throughout the day and night so nature can do its work to insure a healthy vibrant appearance. Contains NO preservatives, parabens, petrochemicals, synthetic ingredients, fragrances, GMO's, dyes or additives of any kind. Nothing works better than Amazingly Beautiful." While my face does not need moisturizers, the backs of my hands do, so I have been using it on my hands. So far, I'm very pleased with the look and feel of my hands after using Amazingly Beautiful. I also have eczema on the outsides of my ears - on the lobes, so I have been trying a little of the moisturizer on my ears as well, and again, so far I like it! I'm very hopeful it will help my ears! So, now for some information about how you can receive a free bottle to try and the give-away details. First, Trusted Health Products will send one free bottle of Amazingly Beautiful Moisturizer to anyone who would like to try it if they are willing to pay the $4.95 for shipping/handling (limit one per household). You will find the details about this at the following link - trustedhealthroducts.com/freeskin or you can call toll free - 1.888.423.7500. Not only did Trusted Health Products send me one bottle of Amazingly Beautiful for me to review, but they are making three additional bottles available for me to give away (USA, Canada, Europe & Australia - readers or anyone in their household - may win one bottle of Amazingly Beautiful one time only. Previous winners please do not apply. Please note: there is NO shipping/handling charge to giveaway winners. The shipping/handling fee is only for readers who want to try a free bottle). 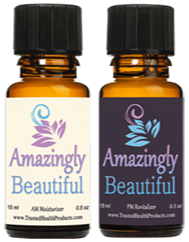 So, if you are over the age of 18 and would like to be in the drawing for one bottle of Amazingly Beautiful AM which will be on May 10, 2015, please comment below to let me know which of the following ingredients you like the most - 100% pure botanical oils of almond, orange, lemon, avocado, olive, evening primrose and apricot oil. I really love the aroma of orange although evening primrose is pretty wonderful as well! In addition, you will receive additional entries if you have followed on Google+, Google Friend Connect, followed by liking on facebook with the tab at this link (not just liking the post) and/or have followed grandma's cookie jar by email. For each of these which you have done you will receive one entry. In addition, if you "share" this post, you'll receive an additional entry (please let me know if you share). This will help me be able to draw names from among people who would like to win one bottle of Amazingly Beautiful AM and it gives you several ways to enter the give-away! I love almond the most. I love the way almond oil smells! I love to eat avocado, but I love the smell of lemon! I really like the smell of almond oil! I like olive the most. Avocado is a close second.